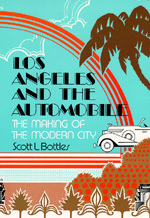 More comprehensive than any other book on this topic, Los Angeles and the Automobile places the evolution of Los Angeles within the context of American political and urban history. Scott L. Bottles received his MBA in Finance and his Ph.D. in American History from the University of California, Los Angeles. He is Vice President and Manager of the Los Angeles Office of the Wells Fargo Real Estate Group.